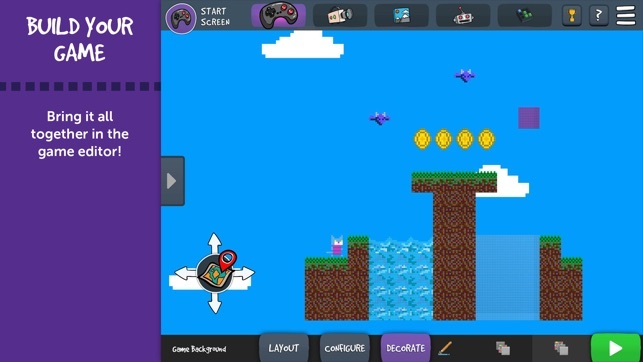 Bloxels is a hands-on platform to build, play and share your own video games! 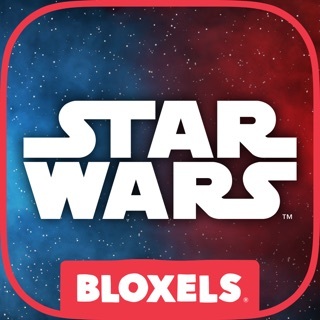 Take advantage of exclusive features including the new “Brainboards” with the Bloxels Video Game Builder Starter Kit, available at www.bloxelsbuilder.com and at major retailers starting October 1st! 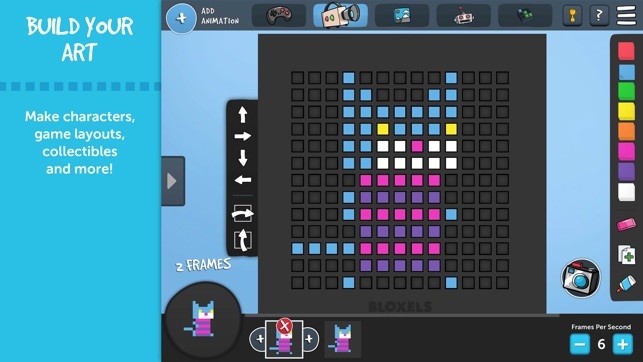 The physical pieces in the Bloxels game set work with this Bloxels Builder app to digitize your creations, put them on-screen and make them playable. Use the 13 x 13 Gameboard and colored blocks to design a room, create the art for game elements and bring your heroes and villains to life. When creating game rooms, each color in your design represents a different element, like terrain, water or a hazard. When building art, the blocks represent the pixelated image. 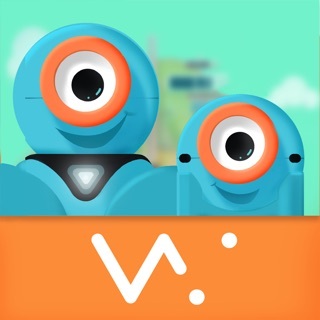 Once you have finished adding blocks, snap a picture with the “in-app camera” to digitize your creation. 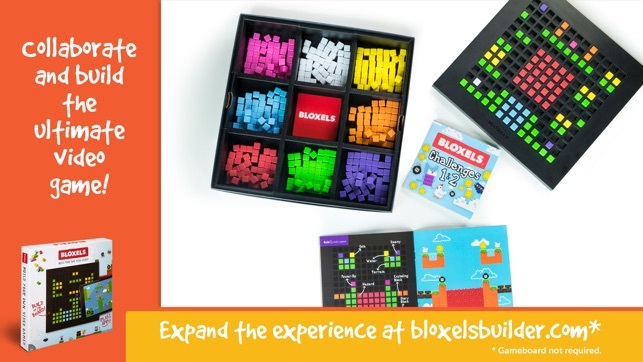 Go from blocks to “bloxels” instantly! When your game is ready to share, post it to the Bloxels Infinity Wall (Players must have a Bloxels account to access the Infinity Wall features – Parental consent required). The community of 13-bit builders can explore each other’s gaming worlds, playing games and sharing elements. Game developers earn coins when others play their games. They can then use the coins to buy content from other games -- you decide which content is shareable. The elements can then be customized to fix and mix into the buyer’s game. Let your game evolve, create new games and see your imagination come to life! NOTE: The Bloxels Gameboard is not required, however some advanced features require the Bloxels Video Game Builder Starter Kit, available at bloxelsbuilder.com and at major retailers. Learn more and watch tutorial videos at kids.bloxelsbuilder.com. If you are experiencing issues please email us at support@bloxelsbuilder.com or visit our new help desk at support.bloxelsbuilder.com. We're here to help! 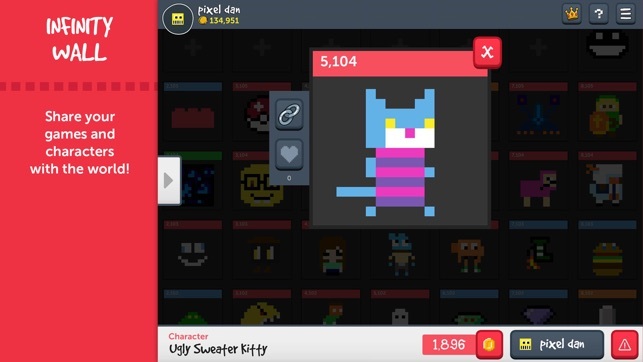 Players must have a Bloxels account to access the Infinity Wall features. Parental consent required. Be sure to check out these other features we've recently released! Good, but has many flaws. Honestly, it’s a good game, being able to make your own games, but it does have its few flaws. For one, the only thing you’re actually doing is making the level layout and the sprites, so technically, it’s more in the style of Super Mario Maker than a game creator, and all because you can’t decide the physics of the character. For example, I would love an option to maybe disable shooting or make your only form of attack jumping. Things like that would be great. Also, when you design the character, unlike literally EVERYTHING else, the hit box of the character doesn’t size with the look of the character, making it to where if you have a skinny character it’s wonky or if you want to make them a 3 by 3 character, it won’t work right. Another thing is going up hill. So, I get that since you can’t create your own sprites it the game can’t define what a slope is, but it SHOULD be able to detect whether you’re walking into a 1 pixel high cliff or not. What I’m saying is that I hate that it doesn’t automatically make you go up one pixel high blocks, because it makes goin up hill a lot harder. All in all, this game is great, but it has it’s flaws. developers implement⭐️ 1.Teleporters. I would like teleporters because I always run out of space to build and so if I'm making an adventure map,I can make rooms. 2.Keys/Locked doors. Keys would make great additions and good addition for dungeon-like levels were you have to wait (?) seconds or minutes to receive the key or beat a boss. 3. Shops/Shop system. The shop should be used with the coins to buy this to maybe help them on adventures or battles. 4. Bosses/Boss Maker. This would be nice so players don't have to use multiple enemies to have one "boss",and maybe add custom moves? 5. Traps. Add boulders, pit traps , and custom traps. 6.Add more weapons. Add swords,staffs,bows, and guns with 5 different upgrades. So say you want to be a Sword man, so start out with a weak sword and upgrade, damage, swing speed, and maybe crits( you don't have to add crits). 7. Random encounters/battle system. Would help with RPGs and other stuff. Great game! But has ups and downs. 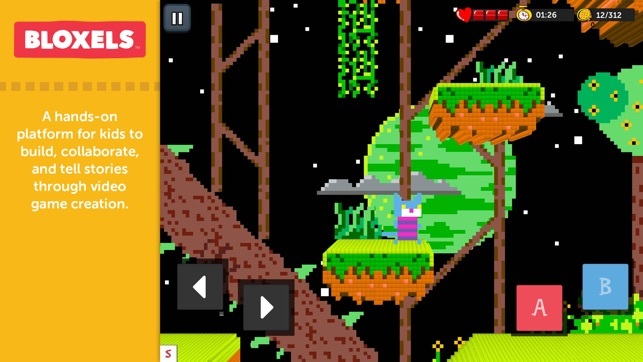 This game builder is a really fun game but it’s quite limited. It’s quite possible to encounter a bug without even noticing it .For example when you die you can shoot your water blaster like projectiles. That bug should get fixed. You should be able to customize that damaging projectile you shoot to inflict damage on enemies instead of a water like projectile. A recommendation to add to the game builder is to have a dot that you can place like on the side of the game board so when you go to add another tile similar to the first one, you’ll have that marker so you know what you wanted slightly changed. For the enemies, I wish you can make them 2 full blocks by 2 full blocks so that there kind of like a boss sort of. When I first downloaded this game I loved it till I just went through the entire game basically. After that I just left it for it on my tablet for months until I saw it buried deep into my apps and clicked on it. That’s when I played it again for another 3 weeks or so and forgot about it again.